Part II of Pirate Lairs, last post was about Tortuga and now we continue on with Port Royal! In 1657 Governor Edward D’Oley invited the Brethren of the Coast to make Port Royal their home port. The Brethren were a band of pirates who’d been tossed out of Hispaniola by the Spanish. (Remember the whole melodrama going on in Tortuga for years, in the profile on Tortuga? Yes, that Hispaniola.) Maybe inviting a band of buccaneers to be permanent house guests doesn’t sound like a great idea to you, but it was a pragmatic solution for the governor — it solved his problem of trying to defend a port city near several major trading routes, particularly to and from Spain and Panama. If you can’t beat ‘em, invite the Brethren to your town and give them letters of marque to plunder any Spanish vessels at will. The very same Spanish fellows, of course, who’d thrown them out of Hispaniola. Those buccaneers could hold a grudge. So, a devil’s bargain — although apparently a quite sensible one, that worked synergistically for years — was struck. In very nearly suspicious timing, around the same time this bargain was struck, England launched a series of attacks against Spanish shipping vessels, and the freshly-appointed privateers were right on the spot to join in, going after Spanish ships and settlements in the region. So, England had successfully set up a system of defense for Port Royal, without having to send over a fleet every time trouble flared. They didn’t need to send a fleet over to the other side of the globe; there was no need, they had pirates on the spot and in their employ. Spain, meanwhile, had to continually defend their property, weakening their position. 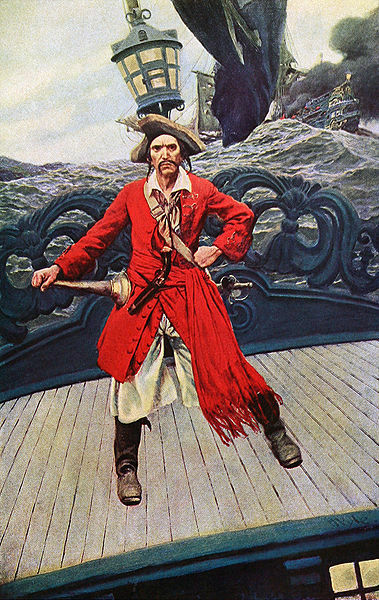 Shown above: The Buccaneer, by Howard Pyle. Oil painting. Date unknown. Apart from this, Port Royal was close to trade routes, giving privateers an easy way to lie in wait for their prey. The harbor was large and had enough room for scores of ships. 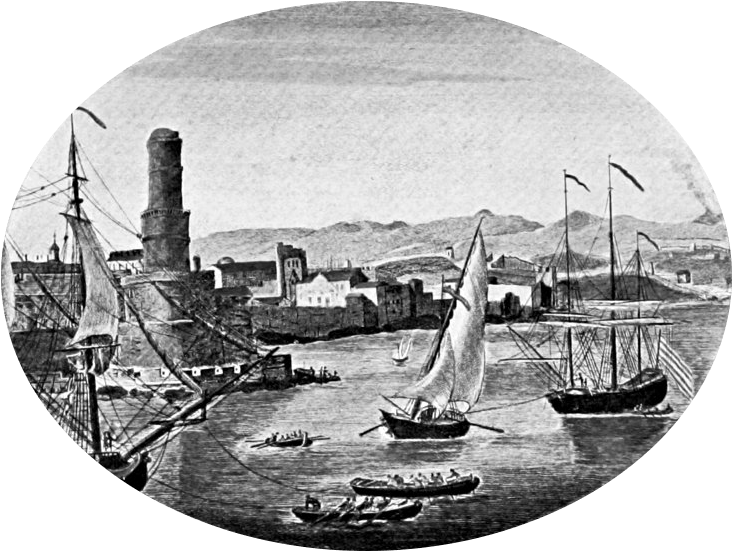 The port city was in the right place to launch raids on Spanish settlements. Privateer Henry Morgan, for example, led a raid on Porto Bello in 1668. By the way, the contemporary Panamanian spelling would be Portobelo, formerly Puerto Bello or Porto Bello, and sometimes spelled outside the nation of Panama as Portobello, as seen in the excerpt below. Nuala Zahedieh, a lecturer at The University of Edinburgh, Scotland, notes, ‘The Portobello raid (in 1668) alone produced plunder worth £75,000 ($124,000), more than seven times the annual value of the island’s sugar exports.’ The town was awash in gold and the most popular pastime — apart from, say, pirating — was carousing. In July 1661 alone, forty new liquor licenses were granted to taverns and according to an account by Charles Leslie, who wrote a history of Jamaica, the buccaneers of Port Royal thought nothing of spending 2,000 or 3,000 pieces of eight in a single night. At the height of Port Royal’s popularity in the 1660s, there was reportedly one drinking house for every ten residents of the city. The city was nicknamed ‘the Sodom of the New World,’ and most of the residents were pirates; hard-living and hard-drinking men and women. As Jan van Riebeeck was more familiar with the East Indies than the West Indies, it’s unlikely — although not impossible — he’d spent time in Port Royal. The unsourced anecdote is included here merely because it’s entertaining and not even that outlandish a scenario, given the lawlessness, mad wealth and precarious lives of the city’s most unusual guardians. From the 1660s onwards, the town flourished. Port Royal housed not only buccaneers but tavern keepers, artisans, goldsmiths and merchants. By the 1670s, nearly 6,500 people lived in Port Royal. The fortunes of the city changed with former privateer Henry Morgan’s appointment as lieutenant governor in 1673, and the appointment of the Duke of Albemarle, in late 1686, as the new governor of Jamaica. Henry Morgan, himself a former cutthroat, wanted a respectable city. At least, he wanted to fulfill the orders of Charles II, whose posterior sat on the throne of England and who’d managed to call a truce with Spain — until the next round of clashes began. Charles II’s father, Charles I had been executed in 1649 during the English Civil War, and Charles II’s own hold on power was in question throughout his early life. He’d spent nearly a decade in exile and only took the throne at the age of 30. He claimed sovereignty over Port Royal, although the claim was disputed, particularly as Jamaica had originally been a Spanish settlement. Maybe he wanted to stabilize and build up this island he claimed as part of England’s vast empire. Maybe he intended to call off open war with rival nations, particularly Spain, and end sanctioned attacks, via letters of marque, on those fleets and settlements in the region. Maybe he just wanted a little peace and quiet. In any case, his guard dog in Port Royal, Henry Morgan, who’d spent years as a ruthless privateer, now turned his attention towards becoming a ruthless pirate hunter. He had some assistance from the Duke of Albemarle, a failed soldier who didn’t thrive in Jamaica, but who’d arrived to become the new governor. Both men died in 1688, but before they did, anti-piracy laws were put into effect in 1687, and the long fight to disband the Brethren of the Coast had begun. 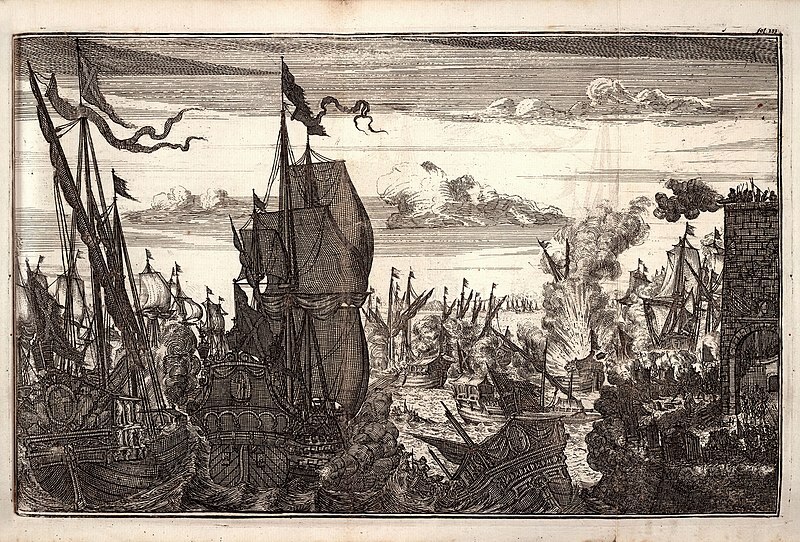 Shown above: Illustration from The Pirates of Panama or, The Buccaneers of America; a True Account of the Famous Adventures and Daring Deeds of Sir Henry Morgan and Other Notorious Freebooters of the Spanish Main by Alexander Exquemelin. ca. 1678. Artist unknown. The end of the War of the Spanish Succession in 1714 virtually guaranteed the eradication of buccaneers from the waters of the Caribbean Sea. The warring European nations had called a truce. Pirates were no longer needed to protect the city or to raid Spanish ships or settlements — instead, they’d become a threat. The devil’s bargain came to an inglorious end. Port Royal, formerly a barbaric and disreputable sort of heaven on earth for pirates, now became their doom and place of execution. Many of the more well-known pirates of the time met their end at Gallows Point in the early 1720s, including Charles Vane and Jack ‘Calico Jack,’ Rackham. 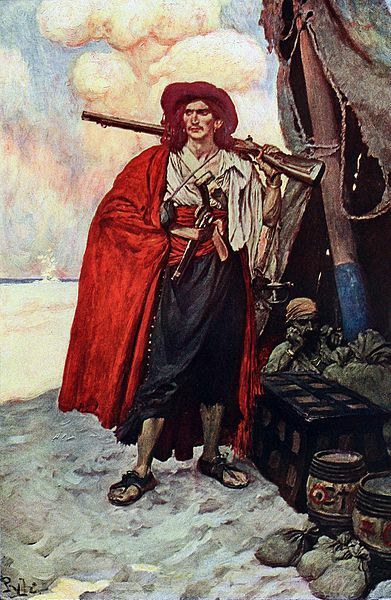 Calico Jack was a shipmate of Anne Bonny, who escaped the noose only to end up in prison, where she then mysteriously vanished from the pages of history. You can read more about Anne Bonny in the series Pirate Queens, during Random Magic Tour: Pirates! The final death knell sounded for the buccaneers of Port Royal, and the town itself, when a devastating earthquake hit in June 1692. The city wasn’t razed to the ground by the shattering quake, no; much of it vanished underwater. Since all the houses were built on what was essentially packed but water-saturated sand, and the earthquake caused liquefaction of the sand (creating an unstable structure, like quicksand), the city merely sank. If a few homes remained standing, they had to withstand the onslaught of the tsunami that followed; power of the incoming wave was so strong that it flipped over ships in the harbor as carelessly as a gust of wind sweeping away a handful of dried leaves. 1692, June 7 [11:43 LT]: An earthquake at Port Royal, Jamaica, caused a landslide within the harbor, generated a tsunami, and destroyed 90% of the buildings in the city. Portions of the city slipped into the water. An 1.8-meter (5.9-foot) wave crossed the bay. Ships overturned. Along the coast of Liganee (possibly Liguanea Plain, site of present-day Kingston), the sea withdrew 274 meters (899 feet), exposing the bottom. The returning water overflowed most of the shore. The sea withdrew 1.6 kilometers (1.05 miles) at Yallhouse (possibly Yallahs). A large wave was reported at Saint Anne’s Bay. Approximately 2,000 were killed in the earthquake and tsunami. After the devastation wrought by the great quake and the tsunami that followed, some 90% of the buildings were destroyed and thousands of people died; some were killed outright and many others in the weeks following, due to injury or disease. Most of the northern section was reclaimed by the sea. Barely one third of the city remained above water, and for years after the quake, the city was cursed with ill luck. Rebuilding attempts seemed to meet with natural disasters at every turn — by fire in 1703, several hurricanes during the first half of the 18th century, more flooding from the sea in 1722, a further fire in 1750 and a major hurricane in 1774. In 1815, another fire destroyed many of the new builds, and an outbreak of cholera in 1850 tore through the entire island population. Shown above: Video clip, divers discover the remains of a Port Royal tavern destroyed in the 1692 quake. From the documentary, Wicked Pirate City, filmed for National Geographic. Finally, in January 1907, another quake hit, and it was the finishing blow. The quake destroyed all the rebuilt areas of Port Royal and took even more of the city underwater. The rivers of gold and cheerfully debauched buccaneers of wicked Port Royal were already a mere memory, and now the cobblestones they’d walked and the taverns they’d fought in all vanished back into the waves, to settle somewhere in the deep, far below the uneasy waters of Kingston Harbor. Today the city is essentially a ghost town, with no political or commercial value apart from artifacts retrieved on archaeological digs, and it houses a struggling population of less than 2,000. The waters of the Caribbean Sea had given the Brethren of the Coast gold, wine, ships, fine homes, treasure, wild nights and glory days; in the end, the sea was all that remained. Next up is New Providence! Please keep an eye out for more about Pirate Lairs within the next hour! I am getting to know lots of interesting historical info thanks to the Pirates! tour. the parrots! amusing bit in this piece. another very interesting historical post!